Providing every client with “Premier Service” isn’t a slogan; it’s backed by a documented Diamond Award Client Satisfaction Rating from an independent third party survey. We are here to advise, negotiate, facilitate and continue to be your Realtors of choice long after you have settled in to your new home or sold your previous residence. Our agents average over 10 years experience and you can be confident we will be your “1 Source” for all your real estate needs. 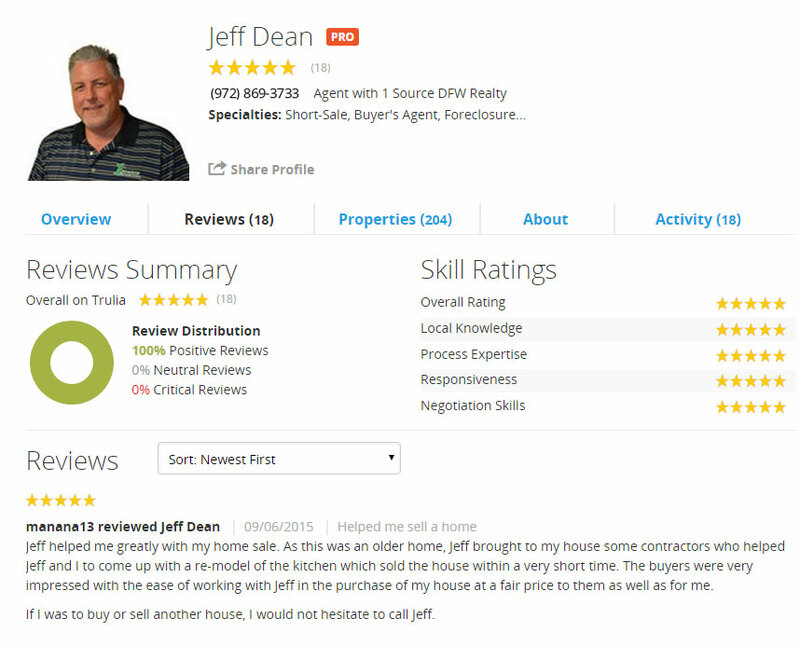 Jeffrey Dean is a Realtor/Licensed Real Estate Broker that lives in Flower Mound, TX. He was born and raised in Irving, TX and has strong ties to the local area. He graduated with honors with a Business Marketing Degree from the University of North Texas in 1992. His wife Joanna is also a licensed real estate broker and was born and raised in Chicago, IL. They have 2 daughters Alyssa 11 and Alexandria 8 who attend Flower Mound Elementary and Lamar Middle School. They are active members at Trietsche United Methodist in Flower Mound. 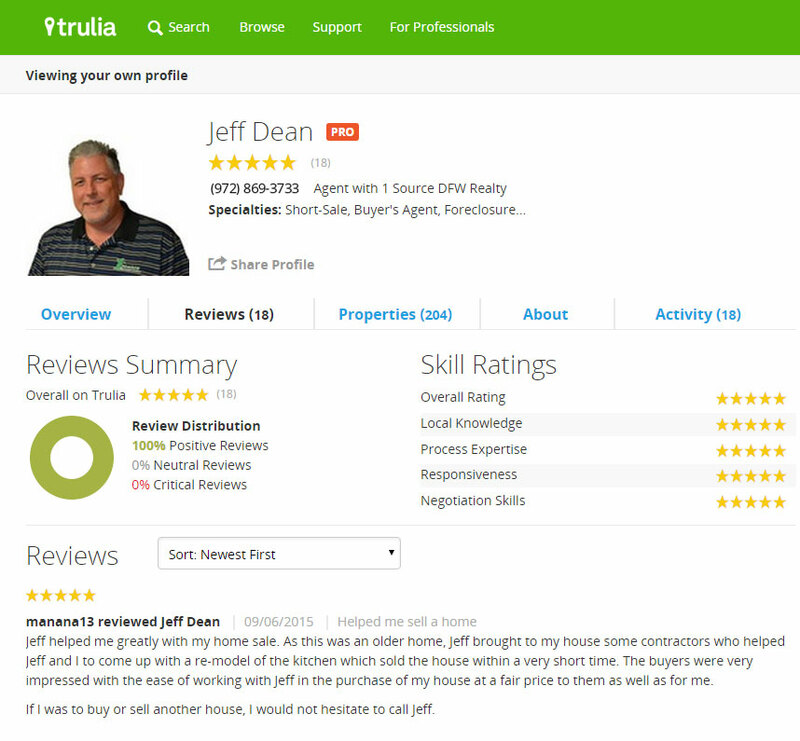 Jeff has been selling real estate since 2002 and is consistently one of the top agents in the DFW area. He has gotten the President’s club award and Premier Service Diamond Award multiple times for 100% customer satisfaction ratings. Jeff believes in a personal approach to real estate, rather than the “team” concept. You get to deal directly with Jeff throughout all of your transactions, and get an individualized interaction and quality service. Jeff owns 2 real estate companies: 1 Source Apartments (apartment locating service) and 1 Source DFW Realty (Residential Real Estate). 1 Source Apartment Locators opened its Valley Ranch – Irving location in January of 2009. It was a new name and new location, but not a new company. We originally started in 1999 as DFW Realty Group and later became a GMAC Real Estate Franchise. In 2010 we left GMAC Real Estate and changed our residential real estate operations name to 1 Source DFW Realty moving our main office from Lewisville to Irving.